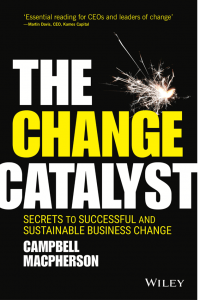 Preview 'Change is Inevitable', Part Zero of 'The Change Catalyst (secrets to successful and sustainable business change)' by Campbell Macpherson, published by Wiley. Disraeli’s statement is correct, but incomplete. Yes, change is inevitable. It is a fact of life that individuals, organisations and nations alike have no choice but to deal with. Those who are able to acknowledge this fact and cope with change will survive. Those who are able to seek out change and actively embrace it will thrive. And yes, change is constant in the sense that it is always present. But to complete Disraeli’s statement we need to add one further critical observation – the pace of change is accelerating. The myriad of changes our societies have undergone in the last hundred years is quite staggering. The breadth of changes that we have embraced over the last fifty years is even more impressive. The amount of change we have all adapted to in the last twenty years is quite incredible. The changes we will all have to face in the next twenty years may just blow our minds. Live long … and prosper? Due to advancements in clean water, nutrition, antibiotics and disease eradication during the last century, average worldwide life expectancy has sky-rocketed. Up until the 20th Century, worldwide average human life expectancy had been remarkably consistent throughout the millennia of our species’ existence. As recently as 1900, humans lived, on average, a mere 31 years. Today, the worldwide average life expectancy is 71.4 – and this ranges from 83 in Hong Kong, Japan, Singapore, Italy and Switzerland to 49-50 in Sierra Leone, Lesotho, the Central African Republic, Swaziland and the Ivory Coast. Average life expectancy is now above 80 in the vast majority of Western countries (the US trails its peers slightly at 78.9). The proportion of Americans who reach the age of 65 has tripled since 1900, from 30% to 90%. 5% of Britons males now live to 96 (98 for females). But it pays to be rich. In 2016, The New Yorker reported that the richest one per cent of American men live 15 years longer on average than the poorest one per cent – and that the gap appears to be growing. The Brookings Institute reported that the life expectancy gap between rich and poor for people born in 1920 was just 5 years. For people born just twenty years later in 1940, the gap had grown to 12 years. For those born in 1960 and later … ? The gap is surely only widening further, after all it is well known that poor people have poorer diets and future advancements in medical science will almost inevitably favour the wealthy. Our expanding life expectancies are already playing havoc with pension companies, many of whom are now severely under-funded and desperately searching for higher and higher investment returns – not easy to come by in the low interest rate, low growth world in which we currently find ourselves. I know of one pension company who has been increasing their investment in life insurance companies as a hedge of sorts – with the dubious assumption that life insurers will be more profitable as people live longer. Famine used to be the biggest killer of humans for many thousands of years. Throughout the vast majority of human existence, droughts, floods and crop diseases have been death sentences for entire communities. Without the inability to move food from one community to another when famine struck, people simply starved to death – in their millions. Today, the only time we hear of significant numbers of people dying of starvation is if they have been caught in an isolated, local war zone – and aid was unable to get to them in time. We may not have eradicated malnutrition; we may not have eradicated poverty; but generally speaking, humans don’t die from famine any more. In fact, it is quite the opposite. Three times as many humans die from over-eating than from malnutrition. It is the same with disease. The 14th Century’s bubonic plague killed a quarter of the population of Europe. Four out of every ten English people succumbed to this terrifying disease. A visit to the churchyards of countless English towns makes this terrifying statistic all too real. Entire extended families were extinguished. Villages were laid waste. But it wasn’t until Europeans started to travel that the carnage really began, as they innocently exported their European bacteria and viruses to the rest of the world – with disastrous consequences. Smallpox, carried to South and Central America by the Spanish Armadas in the 16th Century, decimated communities and nations. The English exported the likes of influenza, tuberculosis, syphilis, typhoid and smallpox to the Pacific, eventually killing the vast majority of the Hawaiian population and having a similar devastating effect on other island nations. Only a hundred years ago, Spanish Flu infected a third of the world’s population, killing between 50 and 100 million people. But the ravaging of human societies by disease appears to be a thing of the past, thanks to immunization, antibiotics and the fact that the world is far better organized. Around the turn of the 20th Century, 200 children out of every 1000 died before they were five. Today that figure, in the West at least, is less than 3. We have had outbreaks of new and dangerous diseases – AIDS, Bird Flu, SARS, MERS, Ebola, … but each one has been contained. Smallpox has been eradicated. Malaria may be next. As a species, we now live long enough to die from heart disease and cancer. But that too may be about to change. A relatively simple way to increase human life expectancy even further would be to wean the West off its addiction to sugar. More people die today from diabetes and sugar-fuelled cancers than those who are killed by war, crime, terrorism or suicide. As Yuval Noah Harari phrased it in his excellent book ‘Homo Deus’ (2016), “sugar is now more dangerous than gunpowder”. Will the sugar-dependent food and drink manufacturers become to be regarded as pariahs in the same way as the tobacco industry has? Will the likes of McDonalds, Coca Cola, Pepsi, Kellogg and Nestle face bans on advertising their products to children? Will they find themselves in court facing charges of knowingly fuelling obesity, diabetes and cancer? It may sound far-fetched but the parallels between the arguments put forward by today’s processed food industry and those espoused by yesterday’s tobacco industry are frighteningly similar. And I have really only scratched the surface with all of the (17 examples) above. The future is shaping up to be like nothing that our species, our planet and our organisations have ever experienced. The way we work, the way our organisations work, the way our governments work – will all change, and the changes will be dramatic. We can be lionesses (male lions are just lazy) – meet the challenge, embrace the future, find the opportunities, help our people to embrace the new changes, fight to make the future a better place and do our very best to reap the rewards of the new world. My money is on the lioness. But before we can channel our inner lionesses, we must first fully appreciate what we are up against. We need to understand why successful change is so difficult to instigate. We need to understand why 88% of change initiatives fail. ‘Obesity Killing Three Times as Many As Malnutrition’ Telegraph 13 December 2012. Two brilliant movies I recommend on the subject are “Fed Up” from the US and “That Sugar Film” from Australia.